The trailhead and parking area for the Caicos Pine Yard Trail. As a new project with limited funding, the trails here aren’t extensive. However the site allows access to a beautiful tropical landscape that few have the chance to see. This site is free to access and close to the attraction of Conch Bar Caves, so it’s worth a stop. Be prepared for mosquitoes as they can be overwhelming during the rainy season. The trail through the wilderness of the pine forests. 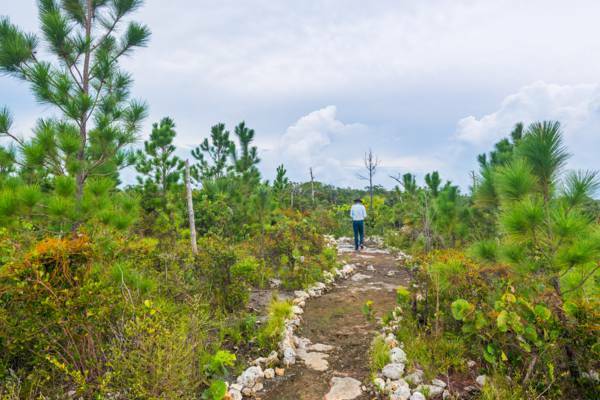 Located on the extensive and low-lying brush lands of Middle Caicos, the Caicos Pine Yard Trail is a tranquil and scenic half mile nature walk and the best place in the country to see the national tree of the Turks and Caicos – the local variety of the threatened Caribbean pine (Pinus caribaea var. bahamensis). A unique and beautiful terrain surrounds this short trail. Along with the pines, majestic sabal palms, West Indian mahoganies, saw grass and thatch palms are abundant. The environment shelters many types of birds, including the bananaquit, Bahamas woodstar hummingbird, ani, Cuban crow, and more. More often heard than seen, Giant blue land crabs also scurry through the underbrush. 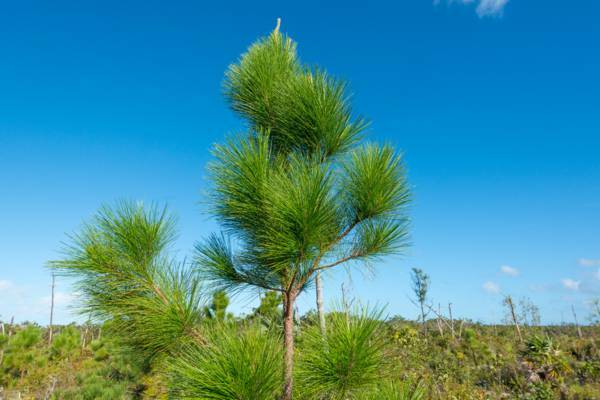 Found only on a few Turks and Caicos and Bahamian Islands, the pines require a specific environment to live and thrive. A constant and relatively salt-free source of water is needed, yet the trees can’t sustain deep and prolonged flooding. Because of these needs, all of the country’s pines are found only on the inland flats of North Caicos and Middle Caicos, and Pine Cay. The Turks Islands of Grand Turk and Salt Cay, and South Caicos do not have suitable low-salinity wetlands and thus no pines. Providenciales does have an interior region in the Frenchman’s Creek Nature Reserve that could likely support the Caicos Pine, however either the Caicos pine was never established in the area or logging took place in previous centuries and wiped out the tree. Two other varieties of trees in the Turks and Caicos might be mistaken for the indigenous Pine. The casuarina (also known as the Australian pine) is common to many beaches and coasts in the country. Not a true pine, this invasive plant has taken over the dune vegetation on several local coasts, notably Cedar Point and Wild Cow Run on Middle Caicos, Half Moon Bay Beach, Pine Cay and Joe Grant Cay. An introduced species and rare throughout the country, the distinct and highly symmetrical Norfolk Island pine was once a popular landscaping choice on Providenciales and Pine Cay in past decades. A beautiful tree, mature examples of this evergreen often tower over the surrounding vegetation. Seed cones on a Caicos Pine tree. Much of the Caicos pine forests is experiencing severe attacks and die-offs from an introduced pest – the Pine tortoise scale insect. Thought to have been introduced with imported Christmas trees, the threat from this scale has spread across the main islands in the country. 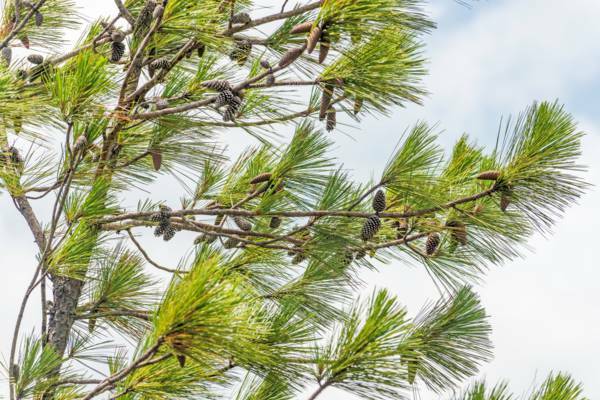 Several approaches are being taken to counterbalance the disease that threatens the pine. A few strains of the Caicos pine have exhibited resistance to the scale, and large numbers of seedlings from these trees are being grown at the Government Farm on North Caicos. On Pine Cay, seedlings have been transplanted back to the original environment and appear to be doing well – a welcome glimmer in the dim outlook for the pine. Controlled burns have also taken place, and these actions are meant to mimic naturally-occurring fires that reduce competing plants and trees and may also fight scale insects. The Caicos Pine Recovery Project, assisted by the UK Royal Botanic Gardens Kew and the local Department of Environment and Maritime Affairs (DEMA), is overseeing the crucial recovery of the pines. Although a bit out of the way, it’s quite simple to locate the Caicos Pine Yard. Both Conch Bar Caves and the defunct Middle Caicos Airport are situated close by. When driving into Middle Caicos from the causeway, you’ll eventually reach the pine yards if you continue straight for about five and a half miles (8.9km). You should pass the turn for Mudjin Harbour and Dragon Cay Resort, the junction with Conch Bar Village, the small power substation, the Middle Caicos Airport (MDS) and finally the caves. The final one and a half miles (2.5 km) of this route is unpaved. After heavy rains, small sections of the unpaved road near the pine yards can have minor flooding and a 4x4 may be necessary. The site is currently free-to-access. There are no bathrooms or facilities present. The poisonous Coral Sumac (also commonly known as poisonwood) is present. This scenic tree can cause blisters and rashes and should be avoided. Mosquitoes can quite an annoyances at times as well. Consider taking appropriate repellent when visiting. Rains can cause the hiking trail to become quite muddy in places, so consider wearing suitable hiking or walking footwear.